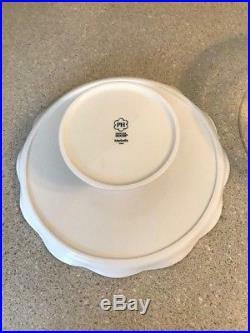 Princess House Marbella Cake Plate & Dome # 1726 - Cake Pedestal Stand & Cover. 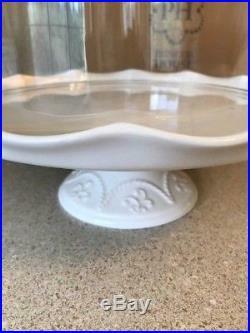 Marbella Domed Cake Stand features a tall glass dome and beautiful ruffled cake plate. Stand Features an elegant ruffled design and Marbella embossed details. 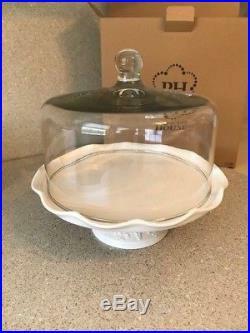 Tall glass cake dome allows for displaying tall layered cakes or desserts. 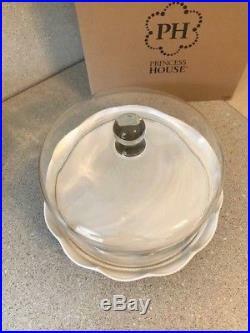 Cake Stand 4H, 12D, glass dome 8¼H, 10½D. Brand new in the box. 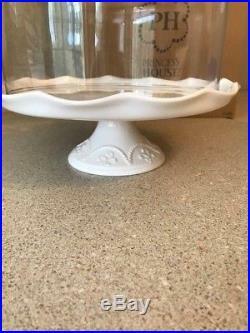 The item "Princess House Marbella Cake Plate & Dome # 1726 Pedestal Stand & Glass Cover" is in sale since Friday, September 7, 2018. 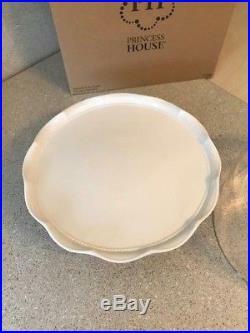 This item is in the category "Pottery & Glass\Glass\Glassware\Contemporary Glass\Princess House". The seller is "fixitdiane" and is located in Manahawkin, New Jersey. This item can be shipped to United States, Canada, United Kingdom, Denmark, Romania, Slovakia, Bulgaria, Czech republic, Finland, Hungary, Latvia, Lithuania, Malta, Estonia, Australia, Greece, Portugal, Cyprus, Slovenia, Japan, China, Sweden, South Korea, Indonesia, Taiwan, South africa, Thailand, Belgium, France, Hong Kong, Ireland, Netherlands, Poland, Spain, Italy, Germany, Austria, Israel, Mexico, New Zealand, Philippines, Singapore, Switzerland, Norway, Saudi arabia, Ukraine, United arab emirates, Qatar, Kuwait, Bahrain, Croatia, Malaysia, Brazil, Chile, Colombia, Costa rica, Dominican republic, Panama, Trinidad and tobago, Guatemala, El salvador, Honduras, Jamaica, Antigua and barbuda, Aruba, Belize, Dominica, Grenada, Saint kitts and nevis, Saint lucia, Montserrat, Turks and caicos islands, Barbados, Bangladesh, Bermuda, Brunei darussalam, Bolivia, Ecuador, Egypt, French guiana, Guernsey, Gibraltar, Guadeloupe, Iceland, Jersey, Jordan, Cambodia, Cayman islands, Liechtenstein, Sri lanka, Luxembourg, Monaco, Macao, Martinique, Maldives, Nicaragua, Oman, Peru, Pakistan, Paraguay, Reunion.